Probably my favourite app on the iPad is the inbuilt camera. With it, children can readily take photographs and record videos of all sorts of things in home and school life. The iPad saves to the Camera Roll and from there, kids can email images, as well as open them inside other apps. The iPad camera or any digital camera is a wonderful tool for giving children a different perspective on life, and helping them think creatively about their environment. 1. Ask children to find and photograph things that conform to certain properties. Children could look for square things, things with four legs, symmetrical things, shadows or shiny things. Make it an ongoing photo scavenger hunt and have children always on the alert for broader categories like animals, plants, or minerals. 2. Liven up a literacy lesson by asking students to find images of things that start with the same letter as their name, or have two syllables, or are in a spelling or vocabulary group. 3. Bring geometry to life by searching for 2D and 3D shapes in the home and school environment. 4. Mathematicians will enjoy searching for or setting up groups of items that conform to a number. Have kids use concrete materials to illustrate a problem, then photograph and annotate their images. Children could also use an app like Curious Ruler to photograph and measure objects in their environment. Once kids have found and photographed their items, you could discuss them, compare them, and have kids email them from the camera roll to the teacher so they can be collected and displayed. Filters could be applied to the images via other apps. You could collaboratively add captions via an image editor and transform them into a slideshow with an app like Haiku Deck or Shadow Puppet. They could also be printed out and made into a display or class book. 5. Older primary students are really beginning to look closely at effective communication so the camera is a natural tool to record examples of this. Having kids learn simple elements of photography can really enhance their skills and help them communicate via the camera. Encourage them to look at the framing of a shot; to “fill the frame” and perhaps look at the rule of thirds. Explain that viewers of images can be affected by the perspective an image is taken from, whether from above or below, close or far. With digital images, kids can experiment freely, unlike film, but it’s also important for them to delete the images they don’t actually want to keep in their camera roll. See more simple ideas at 101 Digital Camera Ideas - Kids and Cameras and GCF Learn Free. items from nature to make mandalas, portraits, leaf people or pleasing patterns and using the camera to keep a record. They could also use their own bodies to create beautiful, interesting or dramatic shapes against different backdrops, or textures. Collaboratively research quotes about beauty in the natural or man-made world and have children look for the perfect background for a favourite quote. 7. A camera is a great way to track a process, and the iPad camera has the advantage of other apps that can help annotate images. Students could record the growth of a class pet, and use an app like Pizap or Skitch to “write” measurements or dates on each image. The comic format of a certain number of panels with captions and speech bubbles is an excellent way to present such a process or procedure. Read more in Using Comics for Information Reports. 8. I love what the iPad camera offers young poets. Combining technology with poetry can be both exciting and add another dimension to our communications. One idea could be to send children out to look for and photograph aspects of their environment from unusual perspectives. These might make interesting prompts for collaborative or individual poems. Haiga refers to a combination of haiku and image that I told you about in Poetry with Kids - Creating Haiga. It makes an achievable project for kids in primary/elementary schools. 9. Digital storytelling is a wonderful way to engage children in an activity that encourages creativity and self-expression. One of the simplest ways to do this is to have children create a caption to enhance an image they’ve taken, and record it on the image via an image editor. Kids could collaborate with friends to set up scenes for photographing, and use the resulting images to tell a five frame story. Or any other number of frames of course. 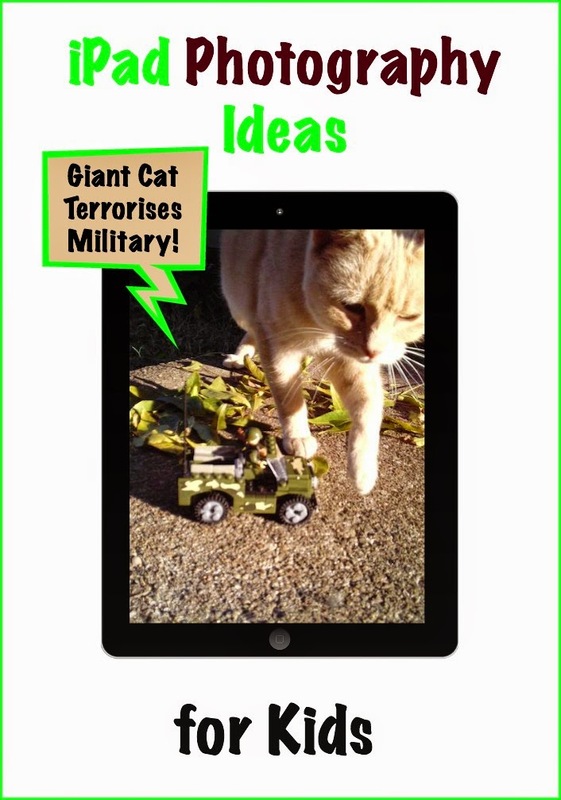 Creating Six Word Memoirs with Kids is another easy, achievable project that can involve the iPad camera. Any of these projects can also be adapted for video. 10. The iPad excels too as a record keeper. When children create something they’re proud of - be it a costume for a play, an illustration, a dance routine, a cake or a road for their toy cars - remind them to create a memory by taking a quick photo of it. Such photos can be sent home to share with families, or added to digital portfolios as part of school record-keeping. iPad cameras, iPhone cameras, more traditional digital cameras - they’re all technology that’s part of lots of kids’ lives already. Let’s capitalise on the fact that many children are familiar with these devices, use them for peer-teaching, and have kids further engage in activities that help them create authentic content. You might also like to read Start Kids Writing with Fun Image Editors, Creating Digital Stories with iPad, and Ways Kids Can Create Images with iPad. You'll find my other iPad app reviews and articles collected on this Pinterest board. These are great ideas, Susan, and thanks so much for including Haiku Deck! We love it when students use the iPad's camera to take their own photos for their Haiku Decks; it's a great way for them to demonstrate their understanding. There are so many fun ways teachers have used our app in the classroom, and we've put together a year's worth of classroom projects here: https://blog.haikudeck.com/year-of-inspiration-for-educators/ I hope you enjoy!